I'd be waay down for that if it's the full game and not a one car deal like GT. So, on Inside Xbox today(3:30 PM PT) we will get first look at the new race regulation system to coming to Forza 7. I sure hope that is what it sounds like, if it is then might be time for me to reinstall F7. Can't believe how little is shown and said on the regulation system. Guess Forza 7 is staying uninstalled for the time being. Well what they showed was pointless. All they showed was a highlighted line that already exists in the game...no information at all on the actual regulation system itself. This really isn;t an E3 thing, if this is what they are having to save for E3 then MS presser is going to be pretty darn bad. More cars are on the way for Forza Motorsport 7 over the course of the next several months. The best part? Some of the vehicles will be free for players too. Citing the recent release of the Honda Civic Type R, Turn 10 announced it will continue to release free cars starting next month. However, it hasn’t yet spilled the beans on which cars these might be. But, free DLC is always a good thing. For Car Pass holders, the news gets even better. We thought the April K1 Speed Pack was it for DLC included in the six-month pass. But Turn 10 had other ideas. In the near future, it will add two additional car packs at no extra charge. Like the free cars, we don’t know much about the future packs either. However, thanks to our forum user’s detective work, we have some ideas. With 16 cars in the initial leak and two more in the follow-up, that divvies up nicely into two full packs plus a handful of freebies. 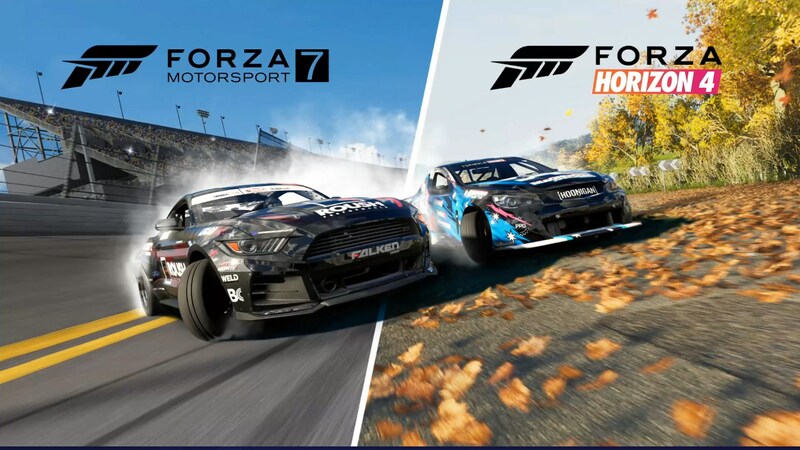 While some of these cars probably are for Forza Horizon 4, there’s a good chance many will make their way into FM7. That’s not all either. For those who missed out on the Hoonigan Car Pack, it’ll head to the Xbox Store next month. 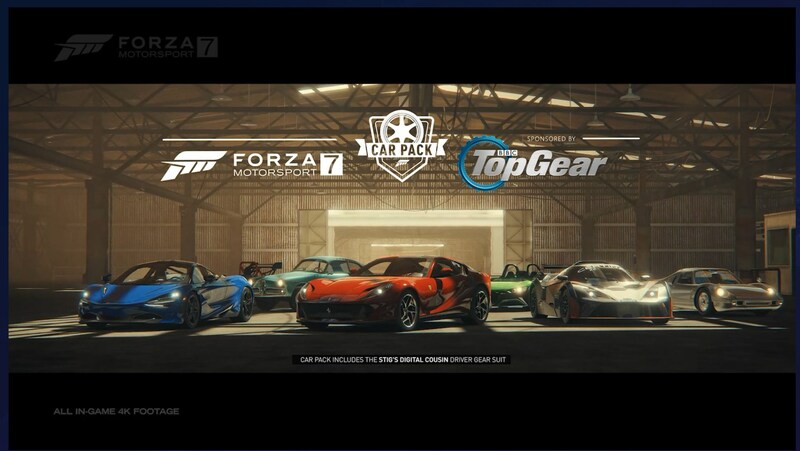 For Car Pass owners this is another free pack getting thrown into the mix as well. However, if you don’t own the Pass, the pack is still available for purchase. The final bit of good news surrounding cars is the Speciality Dealership. If you check our posts week-to-week about the dealership, you know it’s a small list on repeat. Now it seems like Turn 10 is getting the hint from players. As a result, it’s making changes for the better. Starting with next week’s refresh, new cars will find their way into the list. To help players who missed a car the first go around, two of the vehicles will be repeats. However, the third one is going to be brand new to the list. This is all exciting news. More cars in any sim racing title is a good thing and we can’t wait to see what Turn 10 has in store. As always stay tuned in to GTPlanet for any updates! Some fancy parking in the pit lane lobby. 3 laps of Sebring full in the online A class hopper. Testing out my new Ferrari 360 CS tune. Nice clean HUD and clean racing by you. Love the weather too. It was a surprisingly good lobby, apart from that one idiot who took me out at the start. 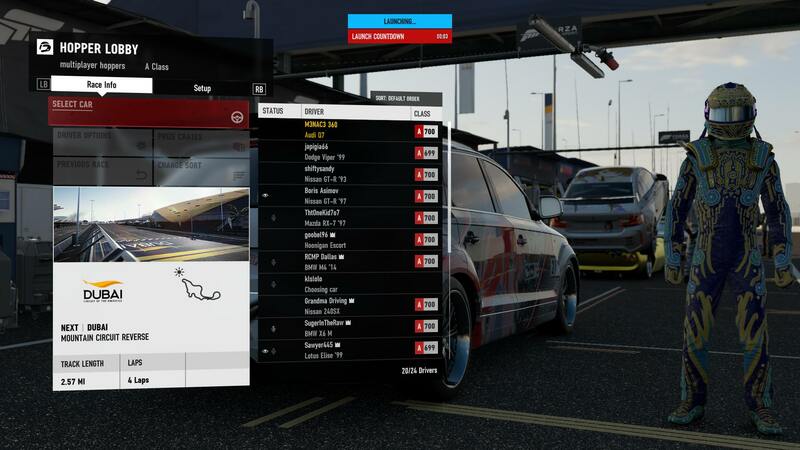 Had about 6 very enjoyable races in this lobby until a couple of dudes entered and ruined it all. I haven't done it yet but GT Sport seems to have found a decent solution to not being put in lobbies with douche bags. Well Forza 7 is getting a penalty system...no clue when or how it is set up exactly...but it is coming. Finally! Hopefully this will help out massively. Didn't think it was possible, but seems I came across the only person online who can race 2 cars abreast through corners. No clue why he slowed down and let me win, he didn't do anything wrong. He put me under pressure and I crumbled at the final hurdle. He fully earned that win. Did accidentally go into the wrong gear? Maybe some lag? No. He sent me a message saying he let me win because I drive angry Not sure about that, but that was his deserved win and he should have took it. Great racing, though. Funny thing is I am rarely angry...People just like to think that they can illicit an emotional response. I was just thinking of how fuking cool it would be if Turn 10 did a game like Driver? Story driven, SP with Forza-esque physics. The next car pack is coming to Forza Motorsport 7 very soon. Supercar fans will have lots to look forward to, as Turn 10 has confirmed the current front-engined V12 Ferrari, the 812 Superfast, is coming next month. Eagle-eyed fans first spotted the car on the official Twitter channel. 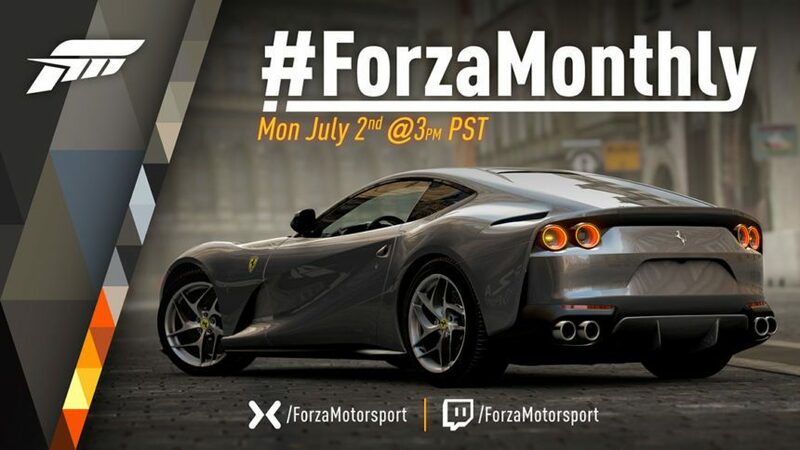 The image up top advertises the second episode of Forza Monthly — a new live stream talking all things Forza, broadcast directly from the Turn 10 studios in Seattle. With the mega-GT sitting front and center, it was clear the 812 Superfast was coming to FM7. Community manager Brian Ekberg then confirmed as much in yesterday’s Week In Review. The 789hp coupe will be the first new Ferrari to land in the game since launch. It’s not the first time this new show has given players a hint of what’s to come, either. Last month’s inaugural episode featured the McLaren 720S in the studio. Ekberg would go on to confirm the Macca’s inclusion in the July update during the show. Of course, car packs in the Forza world aren’t just two cars. The July pack will feature seven new rides, and the team has released the latest batch of clues to tease the community. It’s safe to say the first two are about the known quantities, but can you figure out the rest? Clue 1: It’s not just fast. Clue 2: Way cooler than the first one done by Tony Hawk in 1985. Clue 3: A four-letter acronym for completely awesome. Clue 4: Deliverance, Army of Darkness, Gremlins, Johnny Mnemonic. What do they all have in common? Clue 5: It is only 16.96 miles long and has existed for more than 100 years. You should drive it. Clue 6: It is a relatively compact missile. The July car pack is the first of two summer packs coming to Forza Motorsport 7. Turn 10 extended the Car Pass to include both, whereas it originally only included the first six. In addition to the car pack, a new game update will land on July 2. No details on that yet, though we’re hoping for an update on the Race Regulations system. Stay tuned for more Forza 7 news on Monday! Collection system revamped. All "Normal" cars will no longer be locked behind community events and will be purchasable at any time. FE cars and Unicorns remain locked. Price Crates will no longer contain cars. Lobby hosts gain the ability to kick people during the race. Scrolling through the garage or the dealer supposedly fixed. Will no longer cause freezes and stutters. Drift Suspension upgrade for most cars to increase stance and steering angle. Track Limits still being worked on. Same for the experimental drag mode. Leaderboard wipe will soon happen. T10 hinting at "the most updates" they have ever released in July, August and September. FM8 and Expansions not currently in development. Team is set to work on improving the FM7 experience first before all else. New tracks are a maybe. Wow they listened. No motorsport 8 in development and just improving 7. Look at this dumbass s***. I mean WOW!--Skip to 1 minute. So no FM8 for fall 2019? Nope. It will be a launch title for the next console in 2020.